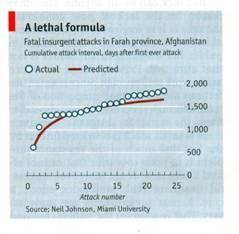 I think I can tell you how to find “B.” In the Economist article (Cry Havoc and Let Slip the Maths of War ECONOMIST vol. 399 no. 8727 April 2, 2011 page 76) they explain that you have found a formula such that if you are given the time of a terrorist act and a parameter called B you can predict accurately all future such acts. The value of B is not evident until the second attack, but from that point on the rest follow a pattern. The article shows a graph that I find very familiar in one respect. You are predicting historical events with an accuracy usually reserved for physics. In my opinion you have touched on a law of nature and history and this law governs B. Bear with me. I need to say two things you cannot possibly know. I do not expect you to believe them yet. The first thing is that if people are more kin they are more fertile. Here is a link. http://nobabies.net/Vancouver%20poster%202011.html (Or you can go to nobabies.net and click on the March 18, 2011 posting). Skip down to the first Iceland chart and you will see that this is true and critically the error bars are very tight. Like your own data this is very clean. I think it is the same law of nature at work. The second thing is that societies grow old and die. Go to the same site and skip down to the Lower Mesopotamian experience and you will see this. The graph shows age of civilizations and their chance of surviving another 50 years. If societies collapsed at random or because of external factors the line should be noisy and horizontal. If they collapsed from multiple internal factors, the line should be noisy and rise. But the line is clean and it falls. Since the line is clean like your own data, the first impulse is to say that they both are caused by the same natural law. Since the line goes down and cannot be from internal or external factors, it must be a consequence of the very fact of a large society. Therefore big societies go infertile over multiple generations and collapse because of a lack of sufficient numbers of capable people in high position. This oversimplifies. Some day you can read the whole link, but right now we need to get to B. It has to be due to consanguinity, the single driving force of history. Consanguinity would be hard to get at statistically, but birth rates are easier. There is the place to look. I would stake a body part on it. A terrorist act is an act of a subordinate population against a dominant population. The frequency pattern must be a consequence of the birth rate of one or the other. One’s first impulse would say that a high birth rate is destabilizing and a high one should correlate with more frequent attacks. I doubt that. Reasoning from the Mesopotamian experience I would say that problems arise because of a low birth rate and hence a lack of competent people in the dominant population. But I would not stake a body part on that one. So look at the areas where you have determined B and graph B against birth rate of each population. I am very sure one or the other will give you the clue as to how to predict B.
Don’t believe me. Believe your own data. But do let me know what you think. I shall be sitting on this concept for a few days and if you are willing to look into it I shall bury it and leave it up to you. Where Tn is the number of days between attack n and the next attack. Dr. Johnson was kind enough to respond with an acknowledgement by April 9, 2011. There have been 13,466 visitors so far.